Review: I freaking loved this book!! Okay, first off, I have to say this: it reminds me a lot of early Supernatural. Not now, when it's dragged on for ten years and has weird angel plotlines, etc. But the original show - 'saving people, hunting things'? YES. I am so glad that I have a pretty physical copy of this to stick on my shelf. Side note here to say: oh my god, I love that this book was set in Thunder Bay. See, I went to school there and the setting is just perfect for this book. It's a pulp and paper city, nestled right on the lake, and it really does have that sort of old-and-creepy vibe. Plus, I just love it in general when authors set books in Canada (it gets neglected)! The atmosphere in this book was well done. 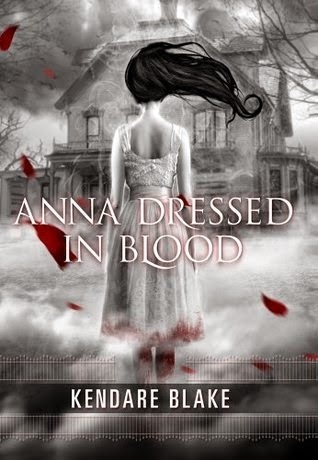 Descriptive, haunting, downright chilling and spooky and just perfect for a thrilling horror book. I said this in my review of 'Shutter' by Courtney Alameda, but I'll say it here too - it takes a lot for horror books to work for me! Generally I just end up bored or not scared at all, but the creepy tones of this one really worked for me. And we just jumped right in from the beginning, too - there's no slow 'this is what I do, yadda yadda' in this book, it's just BAM, action! I liked it. It drew me in right away and endeared Cas to me in just a few short pages. The characters in this book were so well done, too. Like I said, we have Cas, who I couldn't help but like in spite of how closed off he was, and his stubborness - and then we're slowly introduced to other characters who are completely awesome in their own rights. Anna. Carmel. Thomas. Gideon. Even the cat! I love the way the book slowly developed the friendships throughout the book, and the unexpected twists and turns certain things took along the way (particularly romance)! The one character I wish that we had learned more about was his mother - she was well done, I just would have liked a bit more depth because she seemed more interesting. Hopefully there's some of that in the second book! So, yeah. I loved this. I read it in pretty much one sitting last night and I'm pretty excited to move on to the sequel, 'Girl Of Nightmares'... and I'm kind of sad that it seems like there aren't any others :( But I recommend that all of you check this out, it's worth it and I'm sorry I put it off so long!